This is a stacked cake made to look like a purse on the top. The bottom is a double layered cake covered in fondant with zebra stripes. 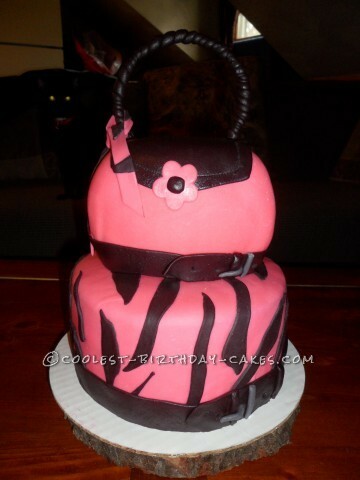 The top cake is 2 – 4″ cakes shaped into a purse covered in fondant. The top of the purse cake is a wire formed and covered in fondant. I made this for my daughter’s jewelry show and it was a huge hit! First cake purse I ever did.